Our last border crossing before the final one into the US. On Friday May 19 we rode 140 miles from Chichicastenago to the La Mesilla border crossing into Mexico arriving about 1:30 in the afternoon. It was a surprisingly quiet border crossing with no people hustling us and no lines of people, nice. That didn’t mean it was fast, we still needed to make copies of various things running to a tienda across the street but after about an hour we were let into Mexico. Yooohooo, we’ve been to Mexico so many times it just seemed easier. The roads in general were nicer and we started switching over to the toll roads just to avoid all the topas (speed bumps). From the border it was another 100 miles to the town of San Cristobal de las Casas where we had a reservation for the night. It was another hot day riding and the sky was threatening rain when we parked the bikes for the night. Sure enough, as soon as we got into the hotel the sky let loose torrential rain forcing us in for the night. Saturday morning we awoke to beautiful blue skies and ventured out for a walk about town. 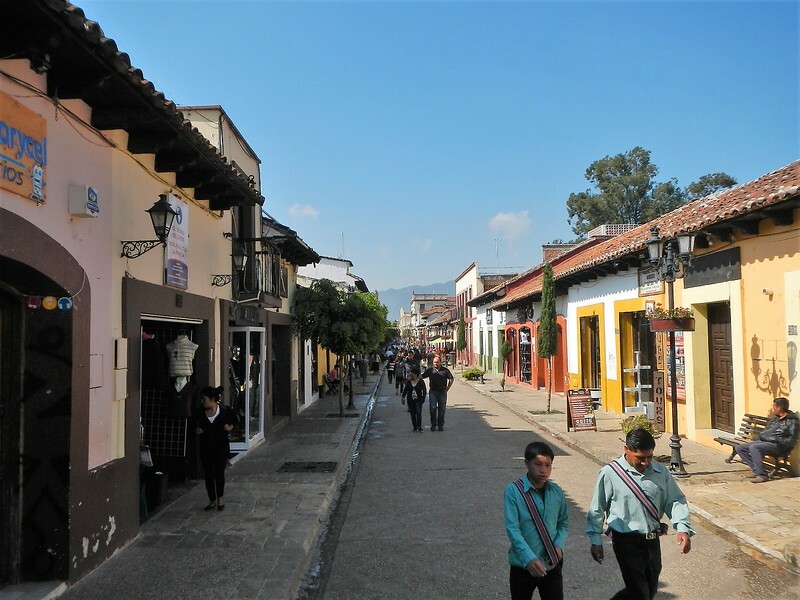 San Cristobal de las Casas is another wonderful colonial town with an easy feel to it and a great central area for walking. We spent a few hours exploring the city. The Saturday market was being set up and we had an easy stroll around before the crowds showed up. Ahhhh, a great way to start the Mexico part of the trip. By noon we were loading the bikes and pumping up both flat front tires, something that was now a daily occurrence. It didn’t matter, our spirits were high and we were looking forward to the day’s ride. 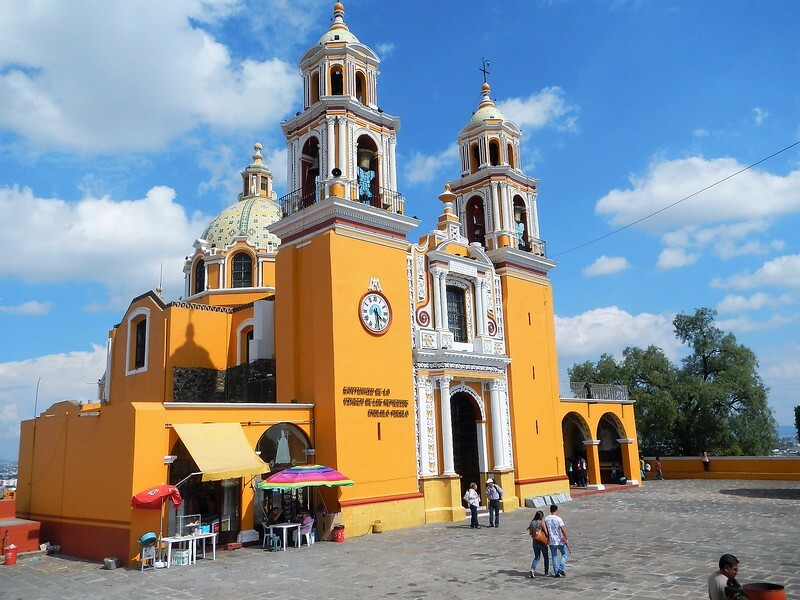 We had been in contact with our friend Art Bone who lives in San Miguel de Allende and he recommended we visit Puerto Angel along the Pacific coast in southern Mexico. Although we preferred to try to stay in the mountains where it was cooler all the routes seemed to come close enough to the coast that we decided to make it a destination. Too far a ride for one day we did a quick overnight in Huilotepec and were back on the road to Puerto Angel on Sunday, we were not disappointed. 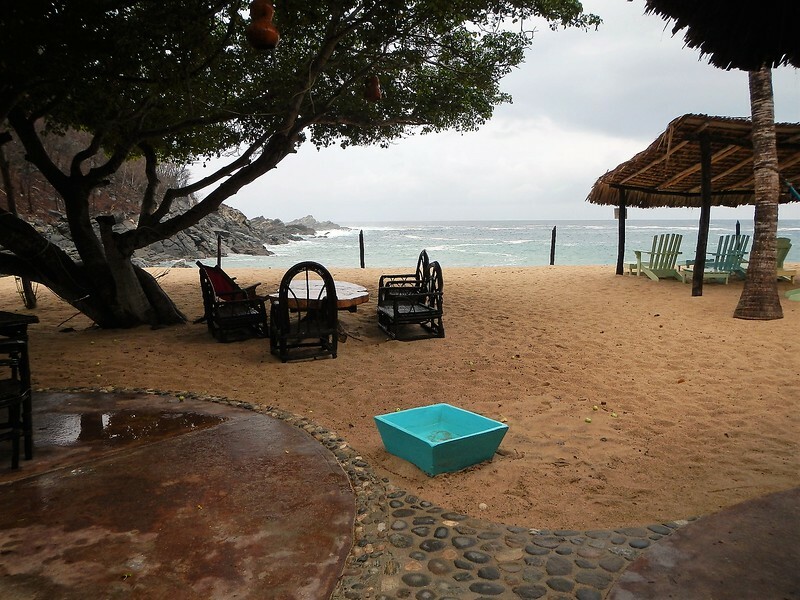 A friend of Art’s owns a little resort called Bahia de la Luna near Puerto Angel so we decided to check it out. The temperatures rose into the 90’s as we approached but the thought of a beach stay kept us motivated to endure the heat and humidity. 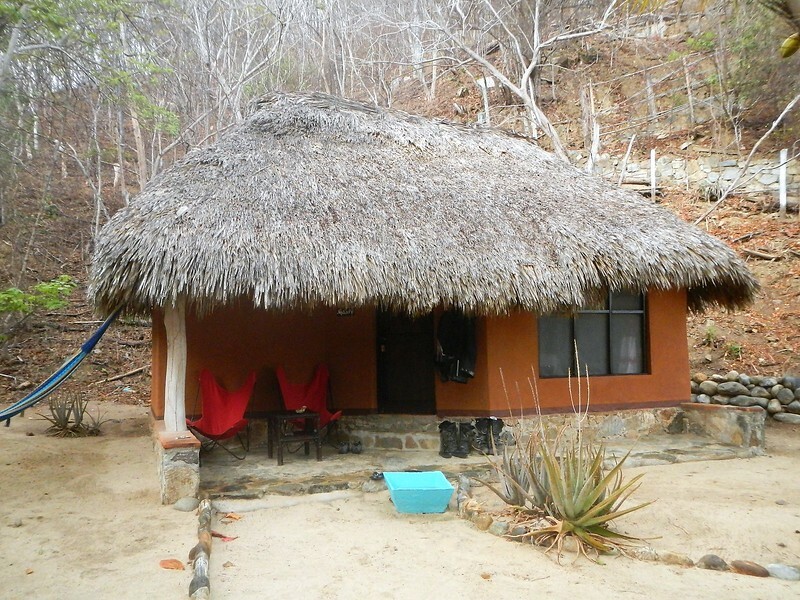 After about a mile of an adventurous ride down a steep, tricky dirt, rock, sort of paved road we arrived to the resort nestled in a tiny valley with it’s own very private beach. 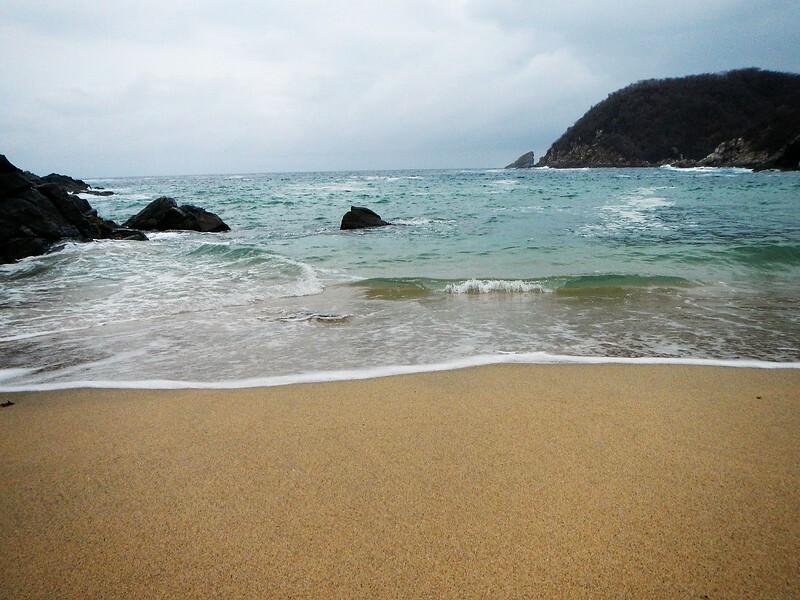 Wow, this was something… really peaceful, no other people except for guests of the resort. A nice breeze off the ocean kept us cool. 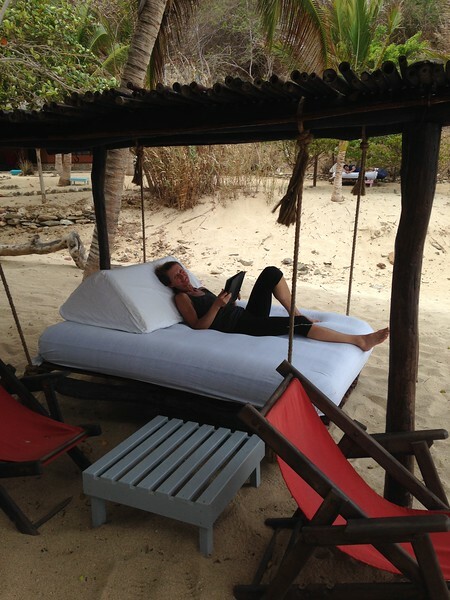 They had these swinging beds, perfect for sitting and reading books and sipping cool drinks. That’s exactly what we did. 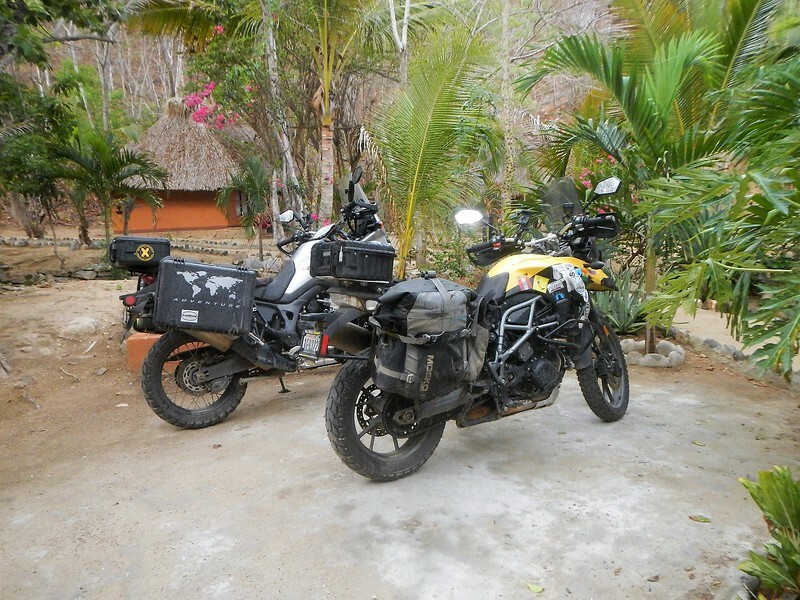 Who said adventure motorcycle riding should be all work? Even the motorcycles seemed happy having a day of rest. 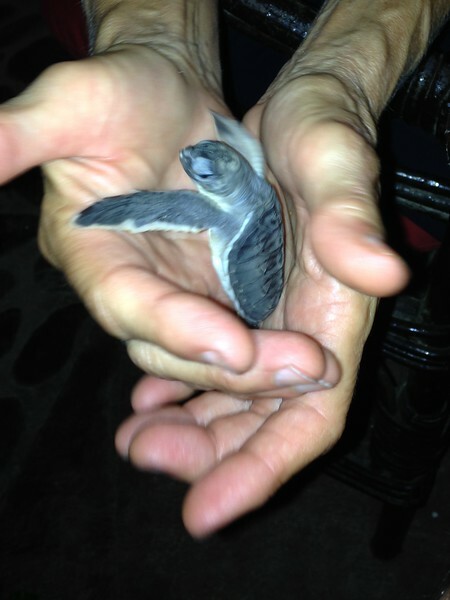 Some eggs had recently hatched and this day old turtle needed to be let out to sea, would Deby mind doing it? Oh wow, she was amazed to be handed this little sea turtle and hold it in her hands. After a few pictures she walked to the beach and let it free. A big highlight for Deby for sure. After two days of doing nothing we were relaxed and ready to move on. 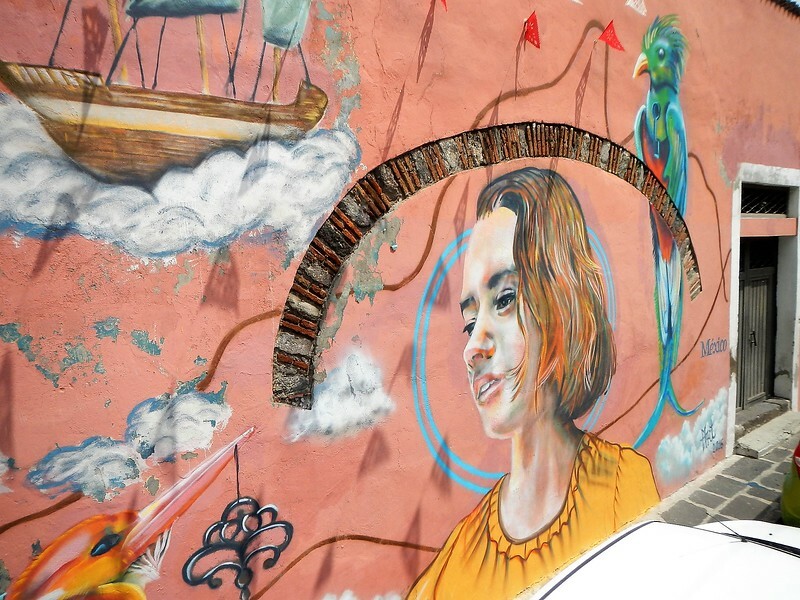 The goal was the city of Oaxaca, a place we’ve wanted to visit for years but never made it this far south. After pumping up both flat front tires we hit the twisty road that rose up into the mountains. 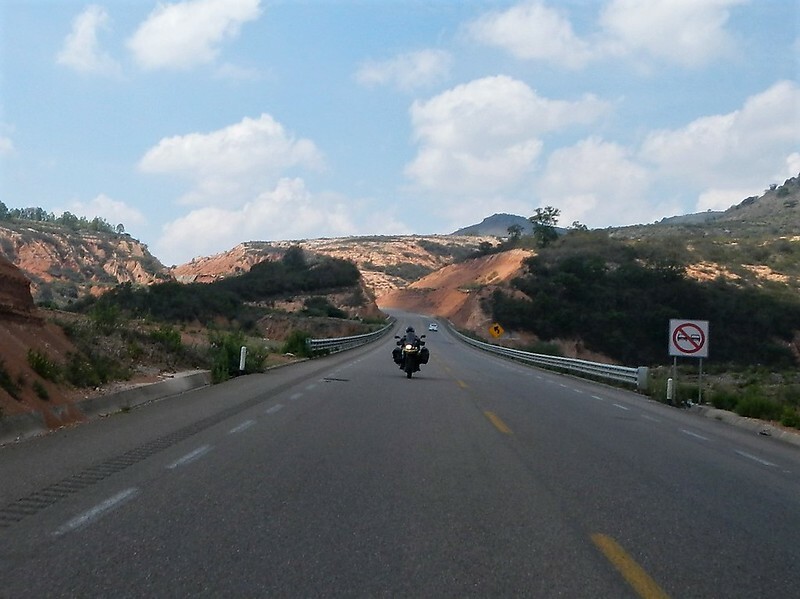 Art Bone told me this was one of the best motorcycle roads in Mexico and he was right. Immediately we started climbing and the temperatures cooled down accordingly, ahhhhh that felt good. In the first 60 miles we climbed from sea level to over 8,000 feet. 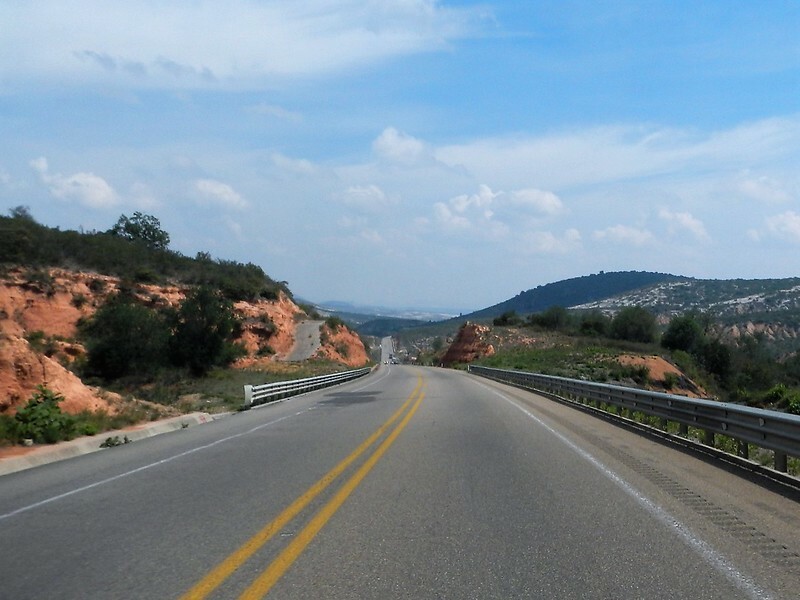 The traffic was light and the winding road was well paved which made for an enjoyable ride and put big grins on our faces. I don’t know why but I didn’t take any pictures….. just having too much fun riding. Imagine a twisty road lined with big green trees climbing into the mountains. A perfect day. 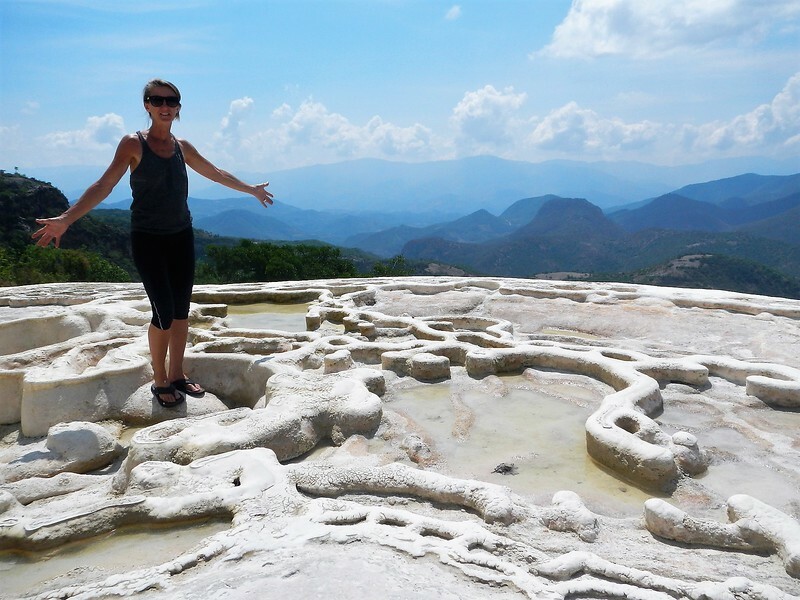 I wasn’t sure what to expect about Oaxaca, so many people told us it’s a city not to miss but I had not done much research on the area. We met a woman at the hotel in Huilotepec that recommended a hotel on the edge of town so we made a reservation at La Victoria Hotel. As we approached the city we were surprised how big it was. We learned the city has 300,000 people but the area has about 650,000 people. Our hotel was on the far end of town so we rode through the heart of the city and experienced the traffic and usual Mexico city traffic madness. As we approached the hotel we rode up one of the hills surrounding the city and found it was a really nice hotel with a fantastic view. Our room had a patio with a view of the city. As was typical the afternoon thunderstorms were building. From our patio we could see the storm moving in. As it got closer the intensity kept building with increasing thunder and lightning. When it hit the hotel it was a full force storm and actually knocked out power for a while. We were glad we arrived when we did. Here is another view of the city from our patio with some sunshine. I was thinking – we could probably spend a few days here….. and, I bet this city is big enough to get our tires fixed. So, with that in mind we booked a couple of extra nights and I started searching for motorcycle shops in the area. There is a Honda “shop” just down the road from the hotel according to Google so I jump on the bike to check it out. It’s a small shop and I learn it’s a branch of a larger Honda shop on the other end of town. This shop has a front tire but no rear tire. I considered buying just the front tire but he doesn’t have an inner tube that would fit so I decided to ride down to the bigger Honda shop across town. They had a really nice Pirelli MT60 front tire and tube. Wow, nice, so I make arrangements to have it installed and took a cab back to the hotel, that was easy. No matching rear tire but it seems like I can get back to the US on the miles left in my Heidenau rear. Even though getting the Honda tire was relatively straightforward it still took all day. I decided I would dedicate this day to getting Deby’s front rim fixed and maybe a tire replacement. Remember, she has a bent rim and I suspected that was the cause of her slow leak. Not knowing where to start I went back to talk to my friend at the Honda shop and showed him the wheel. Of course to make things harder he didn’t speak a word of English so the whole conversation was using my version of the Spanish language. He told me of a shop and we found the address and put it into my iPhone. I rode there is in the increasing heat and there was a sign but no shop. Closed? Out of business? Hmmmm. Back to the Honda shop and he made some calls, oh, they moved… here is the new address. It’s across town so I programmed the location into Google maps on my phone and headed into the city. Just before noon I found the shop in a part of town that was definitely the working part of the city that I presume never sees touristas. 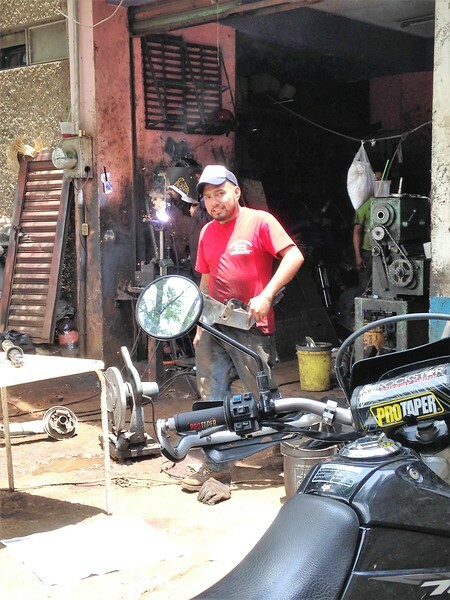 A mostly out door shop that specialized in welding and metal forming. I show up on the BMW and point out the bent rim to the guy with the red shirt. There is about a half dozen people working there and this guy seemed to be in charge. In Spanglish.. can you fix this? Si. Ok, good so far. Then a long bunch of Spanish where I concluded he said, yes but you have to bring me just the wheel. Ok, fair enough. 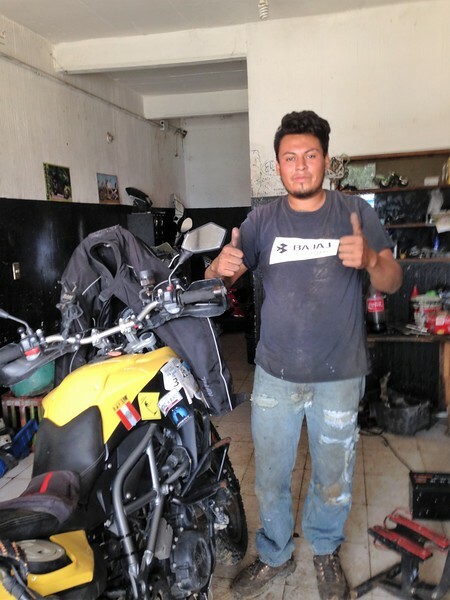 Donde esta la taller de motos? I ask if there is a motorcycle shop near by. Of course there is, around the corner. That is how I end up at this place. Can you remove the wheel and tire from the bike? Si senor… no problema. He get’s me right in the shop and pulls off the front wheel. 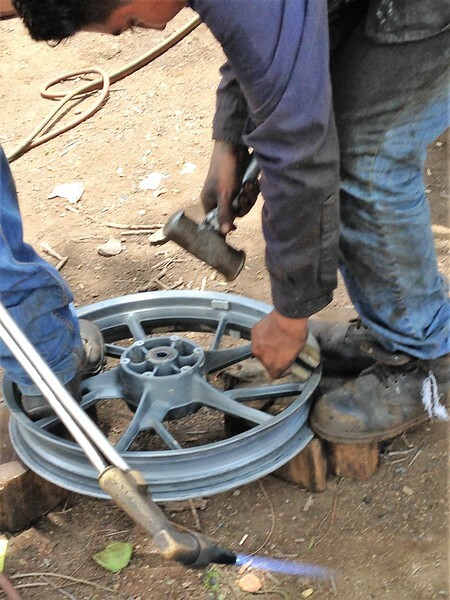 Oh, he doesn’t have the tools to remove the tire from the rim but no worries…. jump on the back of the scooter with the wheel and go a block down to the tire shop where they remove the tire. Now with just the wheel in hand it’s back to the welding shop where I drop it off and wait. They had a long line of customers showing up with all kinds of things to get fixed and I needed to wait my turn. It was one of the funnest things I did so far in Mexico. This was man-land. 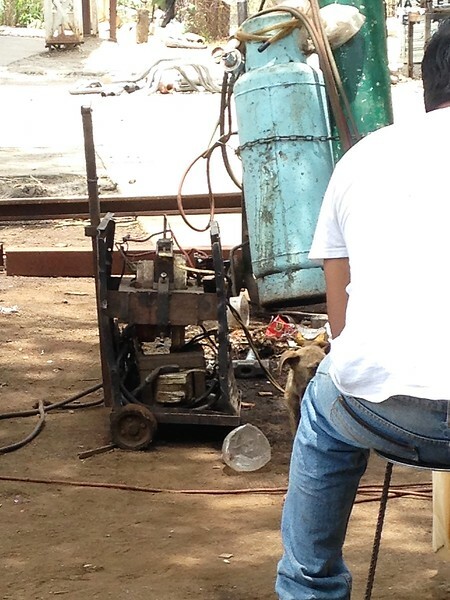 Welding, bending, greasy parts, men standing around acting macho. I got my cool biker mojo working and took some pictures while I observed the process. You might not recognize this but it’s a stick welder. No cover just the guts, you turn a bent nail on top of the transformer to adjust the current. Awesome. There was a guy welding a drive shaft back together, another guy rebuilding an automotive shock absorber, all kinds of things were being brought in to get fixed. I watched one guy strip two wires with his teeth and wind them onto a plug of an angle grinder as a makeshift extension cord. Eventually it was my turn. 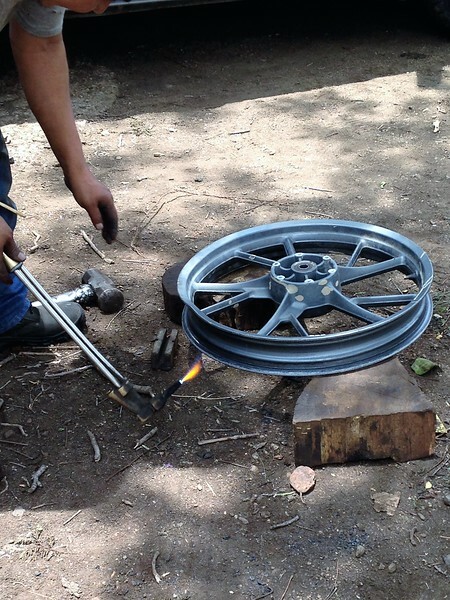 Here is how you straighten a cast rim on a BMW motorcycle. First place on wood block and heat with torch. You know when it’s hot enough by spitting on your finger and touching the wheel. Then start pounding a metal form held onto the wheel. Easy! The assembly process was the reverse of the disassembly. I carried the wheel back to the tire shop to put the tire on. Before they mounted the tire I had the last minute thought to check the inside of the tire to make sure nothing was sticking through that might have cause the leak. Sure enough I reached in and found something coming through the tire, it seemed like a small nail? How did that get there? I couldn’t see anything on the outside of the tire. The tire guy grabbed a pliers to try to get it out but couldn’t. He used a pick and after a while the protruding object just started falling apart. It wasn’t a nail it was a thorn from some type of bush or cactus. Wow, I had heard of this happening but never had it happen to me, a new first. We dug out what we could, put a patch on the tire and put it all together. I watched him check his work by dunking the whole assembly in a big water tank. I cringed thinking of exposing the bearings directly to the water but it was too late so I hoped BMW “sealed” bearings were indeed sealed. Balancing the wheel? Huh? No such thing down here. 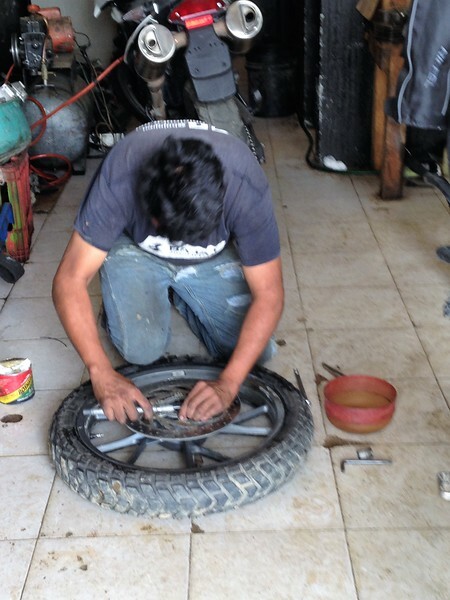 I decided not to push my luck and paid the tire guy 100 pesos, about $5.00. 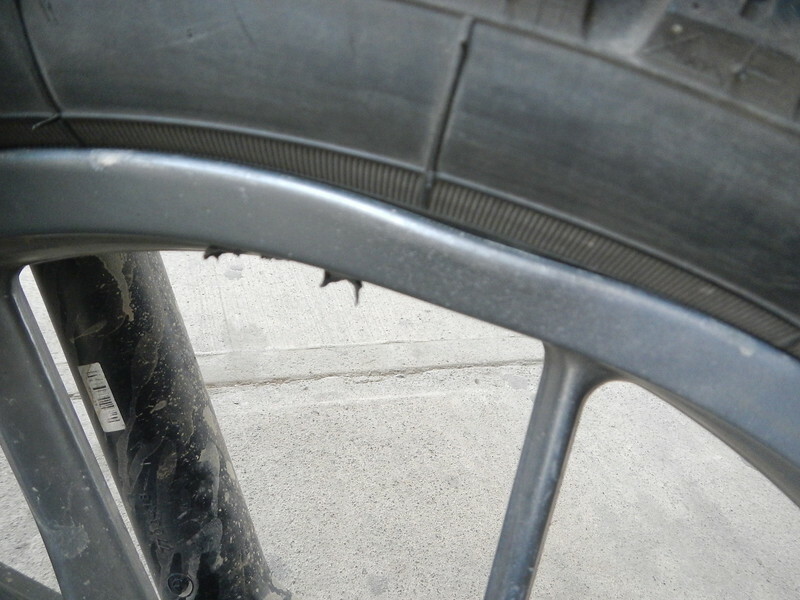 Then the motorcycle shop wanted 200 pesos about $10.00 and the rim guy wanted 200 pesos as well. The whole thing cost $25USD and most of my day. Friday May 26, 2017 – Out for a test ride. How many days have we been at this hotel? I didn’t care, we loved the place, had an excellent room with a fantastic view, the food was good and they had a pool. I went out in the morning and the tires still had air for the first time in weeks. 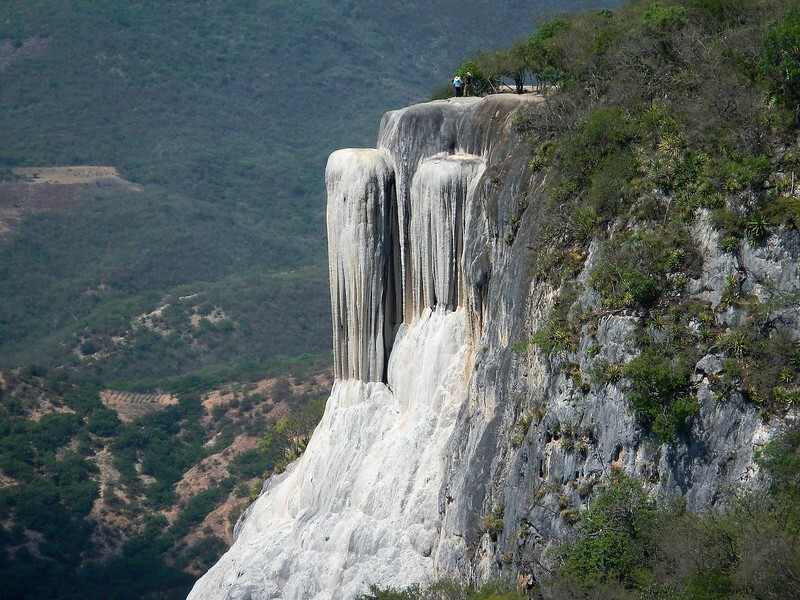 We decided to visit a place Deby read about that was about 30 miles away, Hierve de Agua, which according to Google Translate means “water boils”. We rode out on a really nice road that turned into a toll road. When we got to the toll booth there was a lot of cars parked and people walking around. The lanes usually have a green arrow above them showing which lane is open, they were all red X’s. Something was going on here. We cautiously went to the front and some guy with a red flag waved us through. Hmmm, that was easy. We deduced it was some type of protest and the protesters had taken over all the toll booths in the state of Oaxaca and letting cars through for free. Well, good for us I suppose. 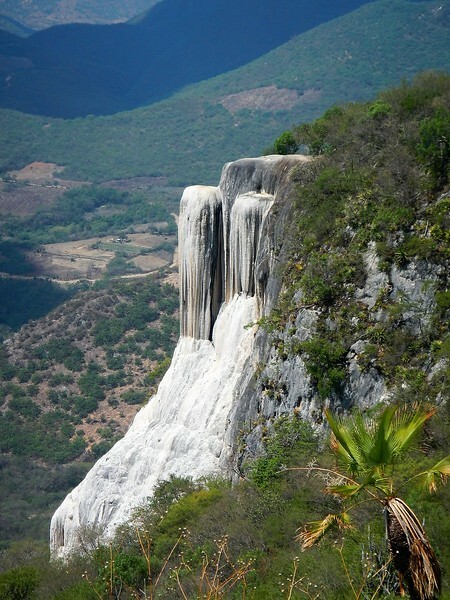 We arrived to the Hierve de Agua and it was amazing. 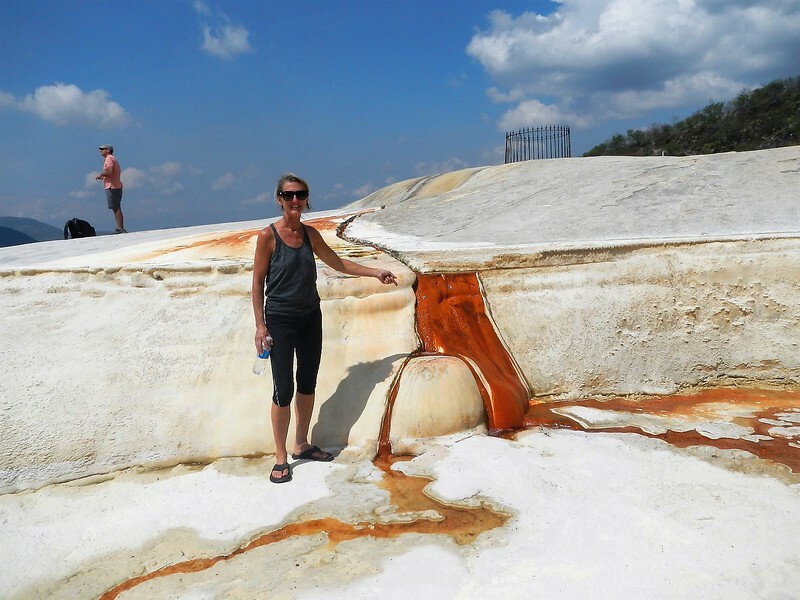 It is a place on the side of a mountain where water “boils” (it didn’t seem too hot) out of the ground and forms mineral pools. 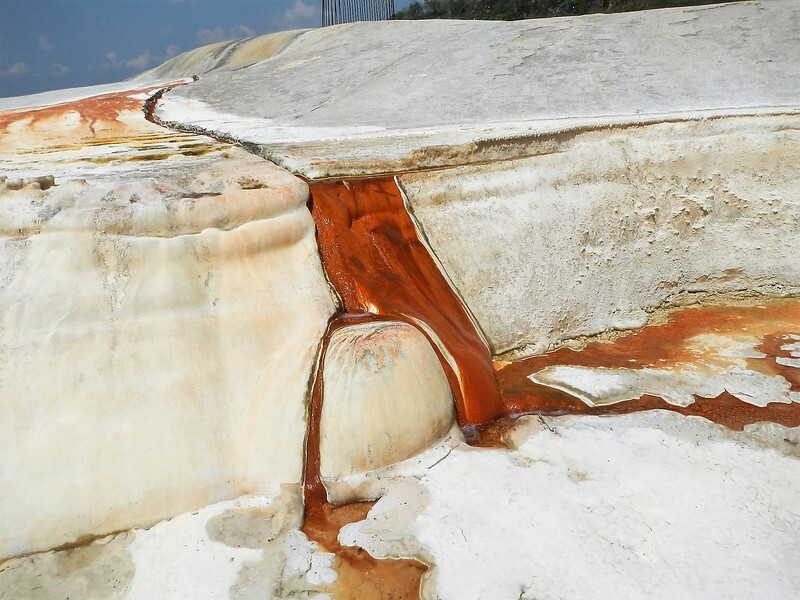 The most incredible thing was that over the eons the water flowed down the mountain cliff and created what is essentially a petrified water fall…. I never heard of something like this anywhere else in the world. Check it out. I mean… I don’t know, there are just no words…. The water “boiled” out of the ground to form these formations. 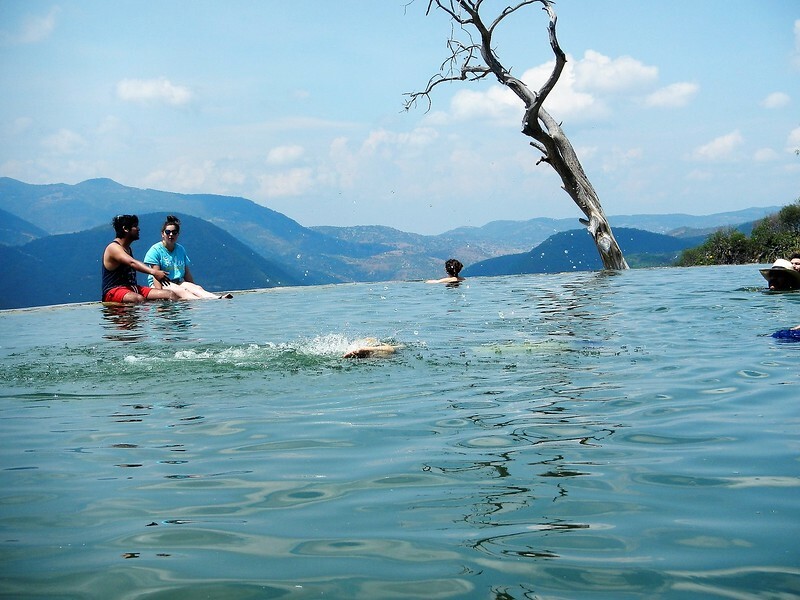 We took a dip in the refreshing pool of mineral water that flowed over a wall to make it like an infinity pool. The surrounding mountain views were just as beautiful. After a couple of hours we rode back on the wonderful twisty roads (which were still free) back to the big city. 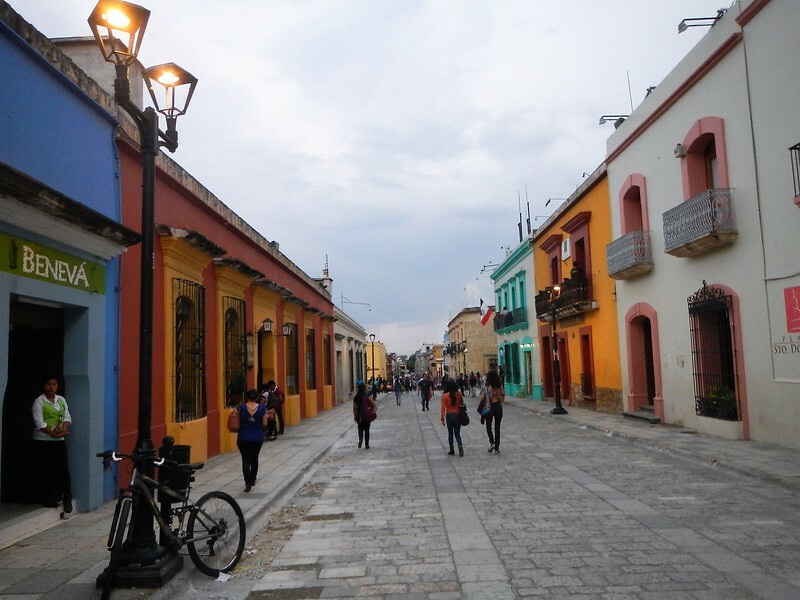 With some time left in the day we took a cab into el Centro to actually check out the heart of Oaxaca. 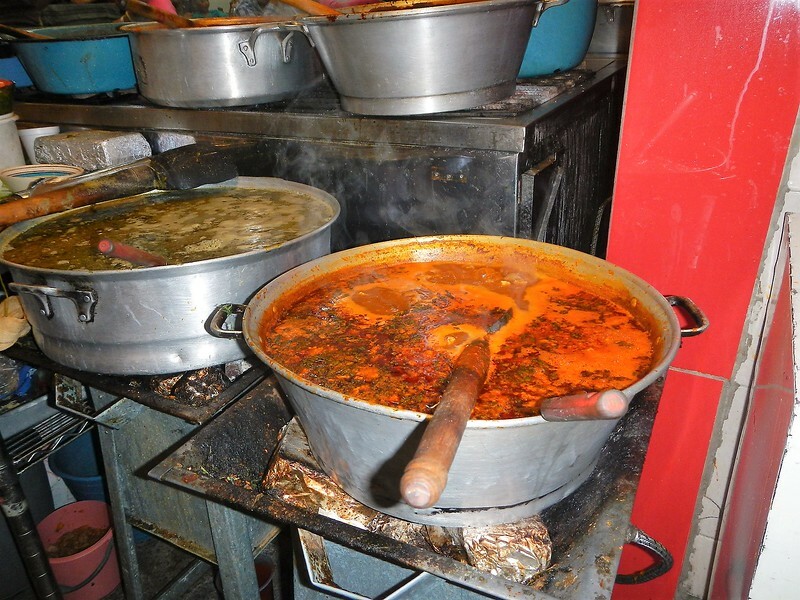 It is another wonderful colonial city that is very easy to walk and visit shops and restaurants. We went to one restaurant that was recommended by our friends Ted and Megan (dang, can’t remember the name right now). 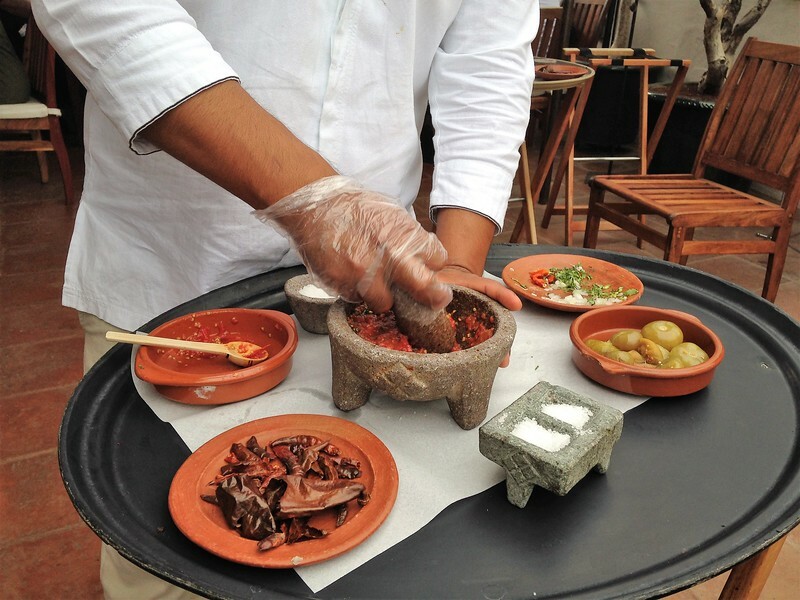 They came to our table and hand made our salsa, it was really good. 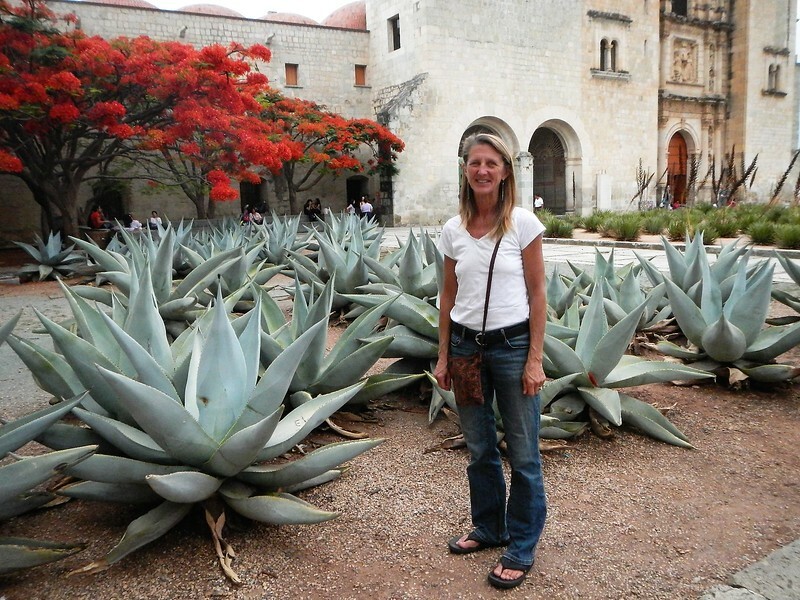 We had a nice walk about town, Deby liked the decorative agave plants in the square. 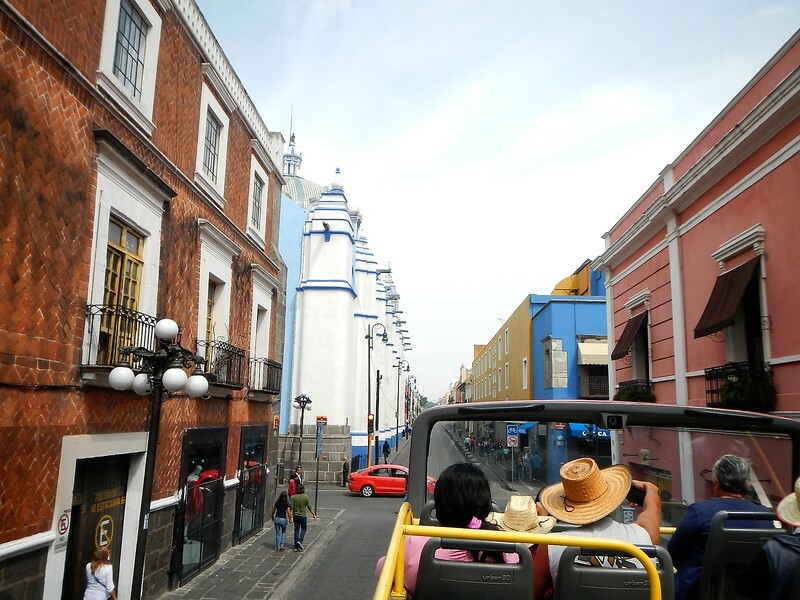 And, of course, cobble stone streets, colorful shops, easy pedestrian walkways. A nice way to spend a cool evening. This guy was setup along the road. 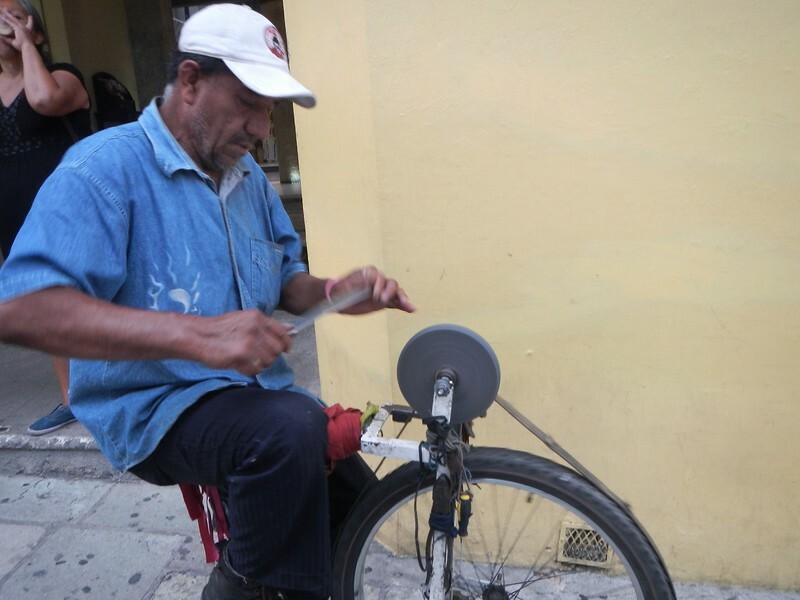 He converted a bicycle to be used as a bench grinder. I presume he was a portable sharpening service. 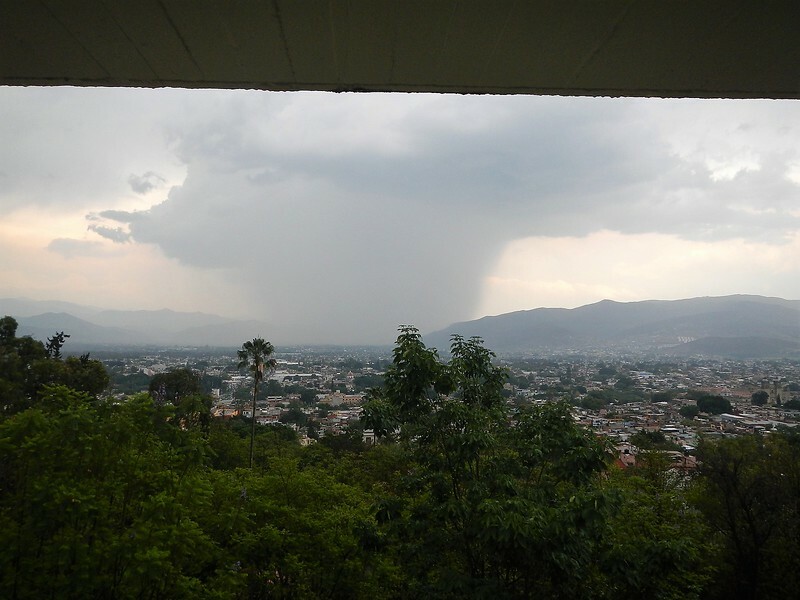 It was a nice way to wind up a few days in the city of Oaxaca. Sadly, but with good tire pressure, we decided it was time to move on towards the north. We looked at a map and decided on the small town of Cholua about 220 miles away would make a nice destination for the day. Online we found a small botique hotel and made a reservation. Then a strange thing happened. When we got up in the morning we both went to the balcony with coffee and iPads in hand to download the Sunday paper. About the same time we looked at each other and noticed our downloaded papers were for Saturday. It took us a minute but we realized it wasn’t Sunday at all. Geesh, the dangers of motorcycle travel. Hmmm, what about the hotel? We checked and sure enough we made the reservation for Sunday not Saturday. 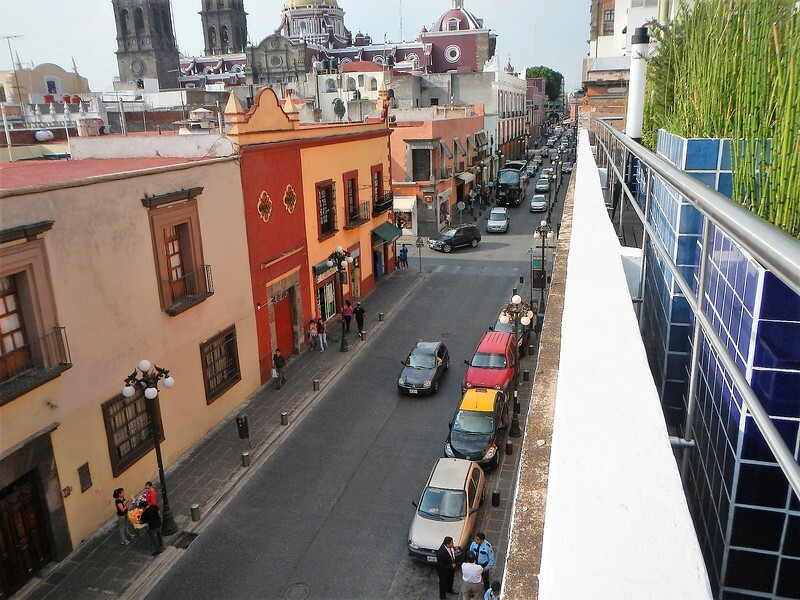 I called and they were booked so we made a last minute scramble and made a reservation for the nearby city of Puebla. 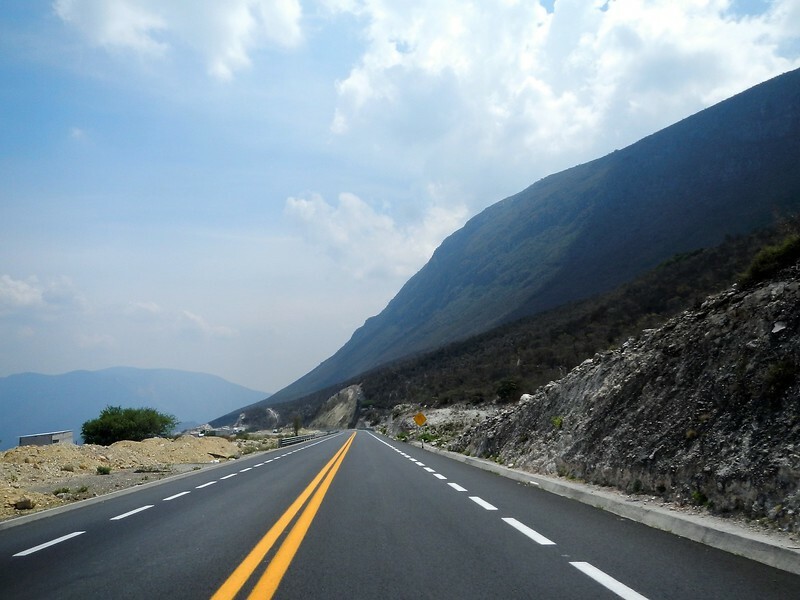 The ride to Puebla was beautiful as usual in this part of Mexico. Easy roads, high elevation so it wasn’t so hot and nice riding. Deby is still behind me with a big grin. We arrive in Puebla and checked into the NH Hotel which is part of a national chain. It was a nice place with an underground parking lot for the bikes and only a block from the main part of town. 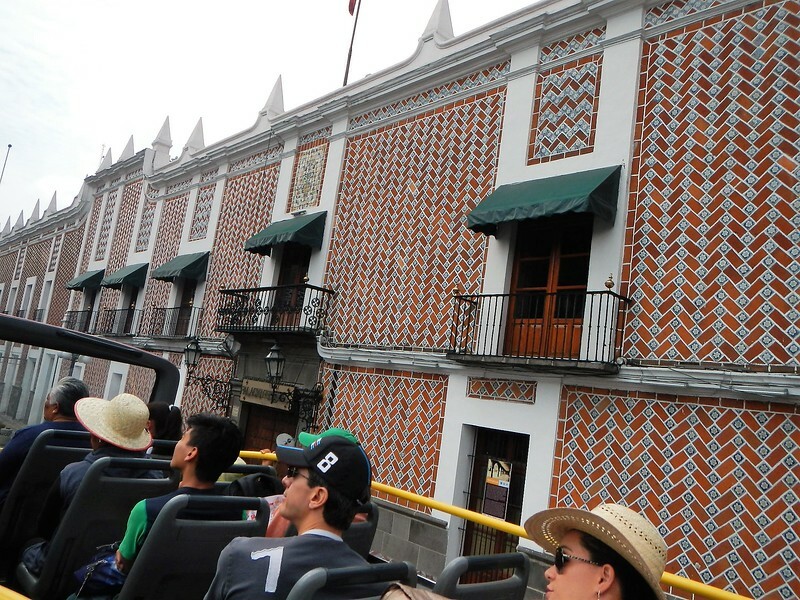 I had never heard of Puebla, Mexico and wow, what a nice city. We went out for a walk and totally enjoyed the town. Being the weekend there were a lot of people out and about. There were outdoor booths, art galleries and lots of activities. 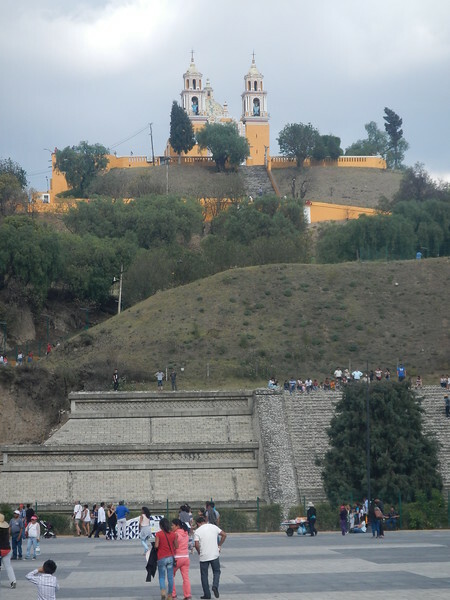 We learned this city had the most steeples in Mexico, over 2,000. 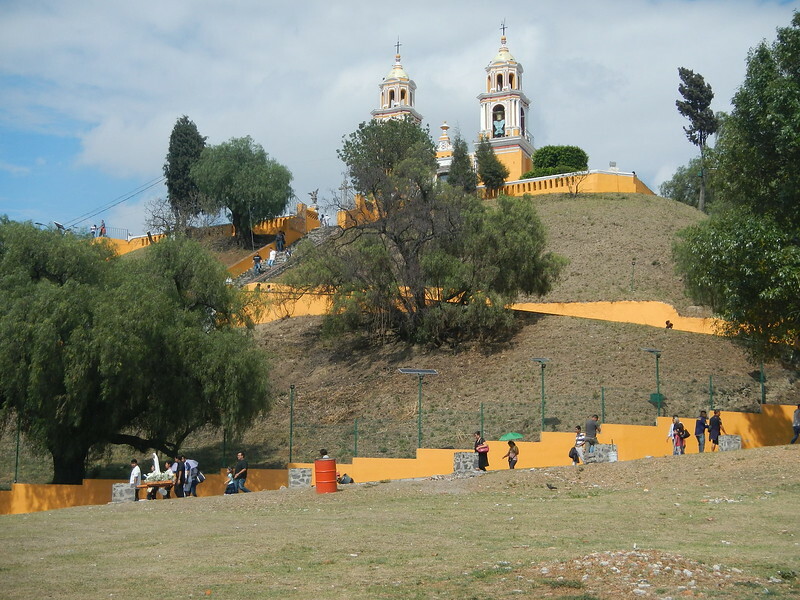 It would only be a 20 mile ride to the city of Cholula, basically a suburb or Puebla, so we decided to explore Puebla a little more in the morning. 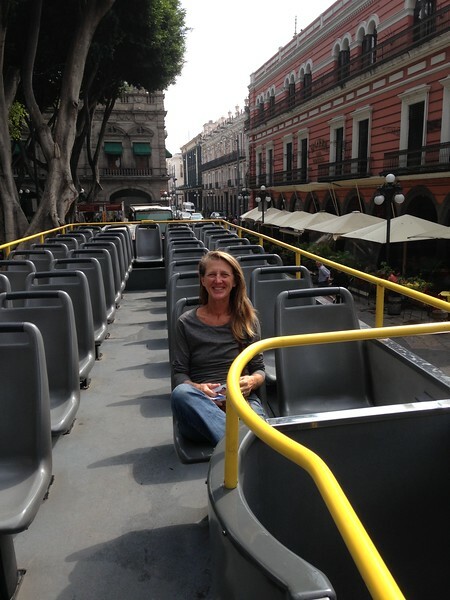 They had these double deck buses for tourists so we jumped on one for a tour of the city. Lots of churches and interesting brick buildings. 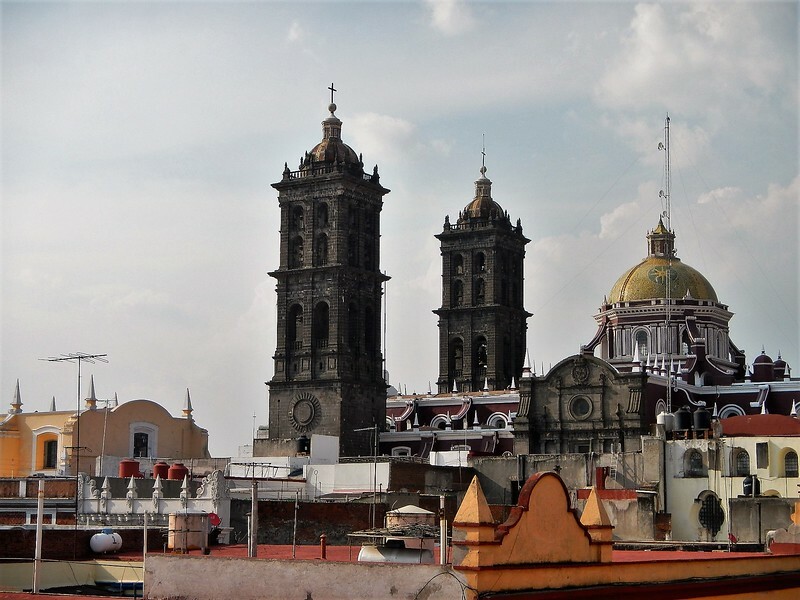 These are supposed to be the tallest steeples in Mexico. After the bus we toured a most excellent modern art museum. Even I was impressed not only by the art but the building itself. Truly world class. We took this picture from the rooftop restaurant. 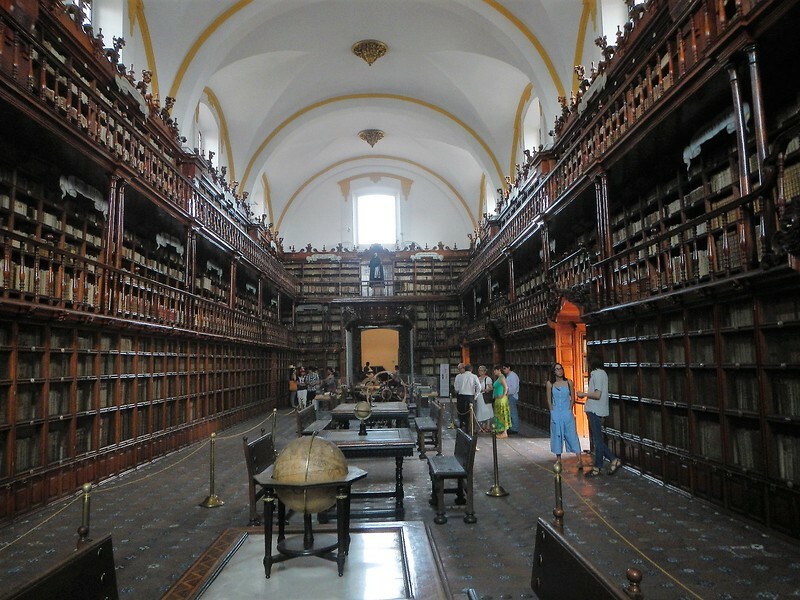 We went to visit one of the oldest libraries in Mexico. This was right out of Harry Potter. 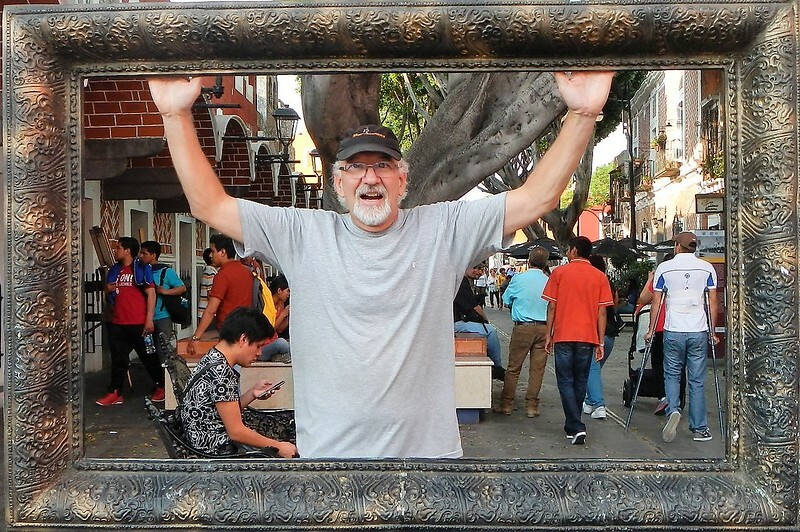 Walked to the arts district where I was framed..
What a great city. An unexpected gem where we had a fantastic time. I would put this on my list of places to return to. 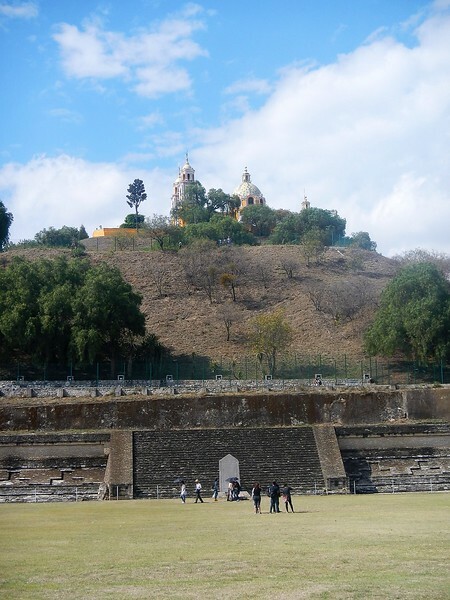 Later in the day we made the short ride to the city of Cholula and checked into the La Quiinta Luna Hotel. 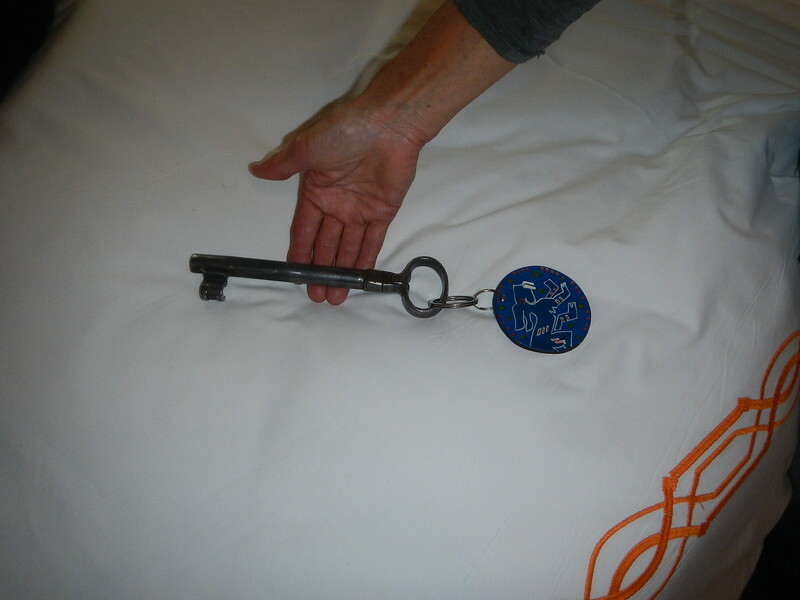 A nice boutique hotel that wins the prize for having the biggest key for the door. But enough of that, what’s in the town? Another small town with an active square. Since it was Sunday a lot of people were out and they had a small carnival setup. We soon found the square and local market. 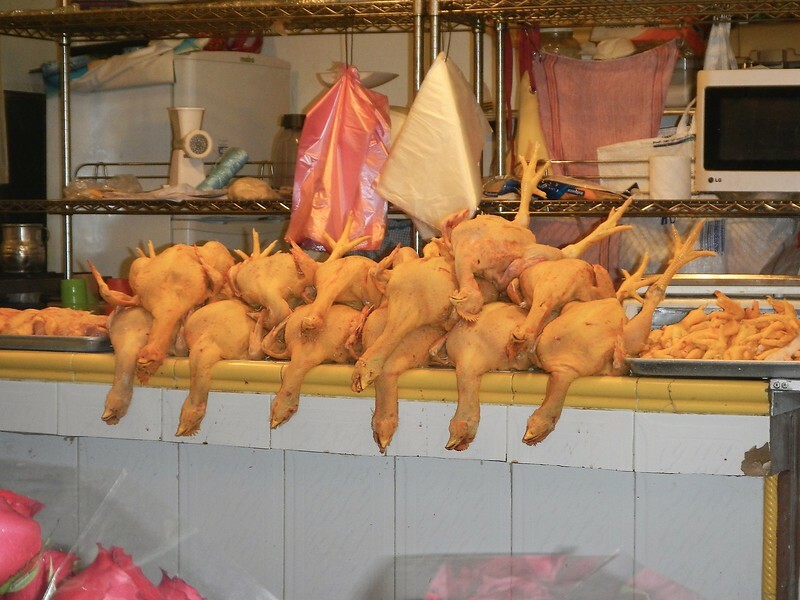 You get the idea….. another fantastic market. 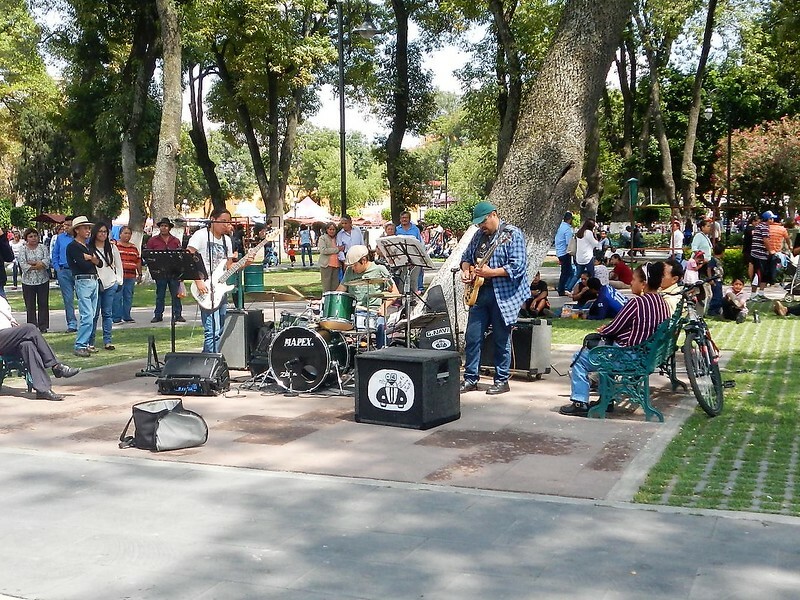 Out on the square we heard some classic rock music. Their own three piece jam band. Then we hiked up a hill to this church. Except the “hill” wasn’t just a hill. 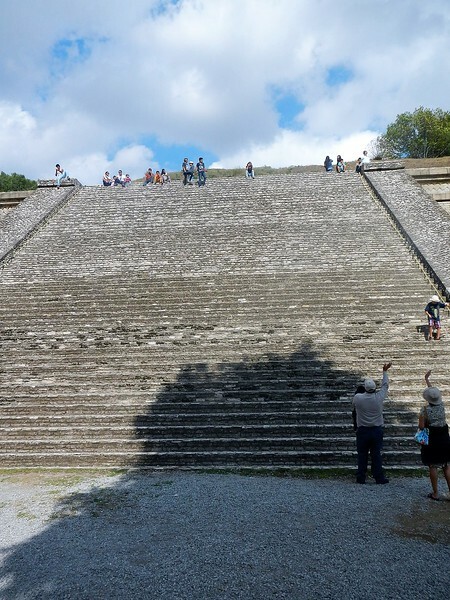 Buried under it was a Mayan pyramid. Yes, you got that right…. they discovered that under the hill is actually an buried pyramid. That is amazing. They excavated some of it to expose the steps and some of the other structures. 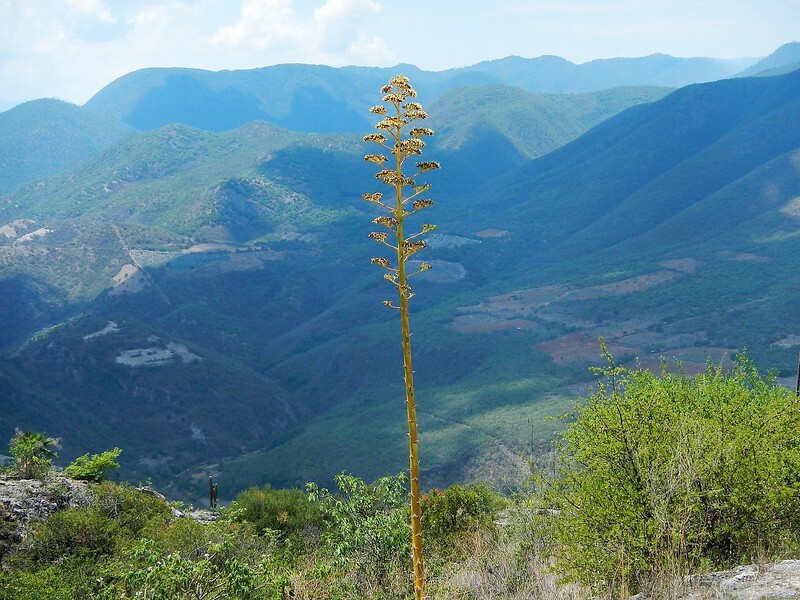 I guess you never know what you are going to find when digging around this part of Mexico. Another surprising city and day. 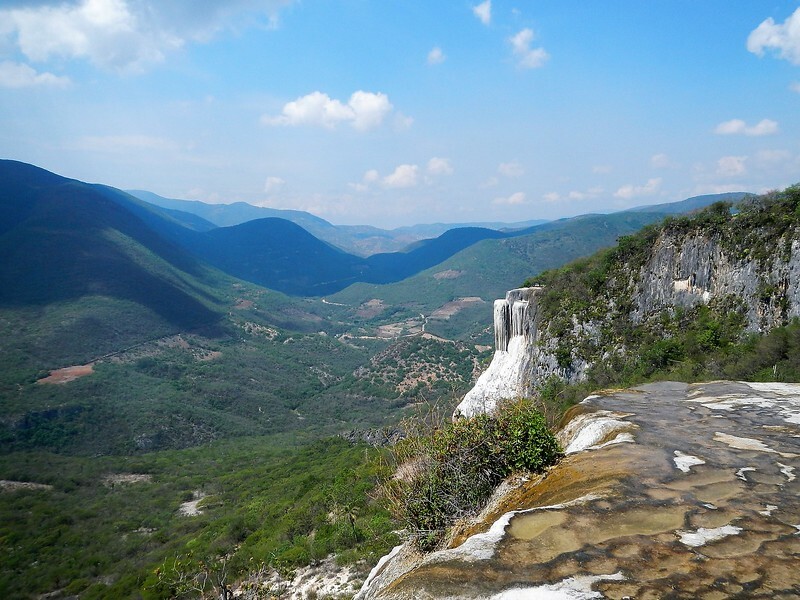 Deby and I were once again reminded how little people in the US (including us) know about the country of Mexico and the places to explore. Next…. more fun in Mexico. Thanks for reading! I once photographed a wedding in Puebla, I think it was in 1980 or so. It was at the Cathedral. 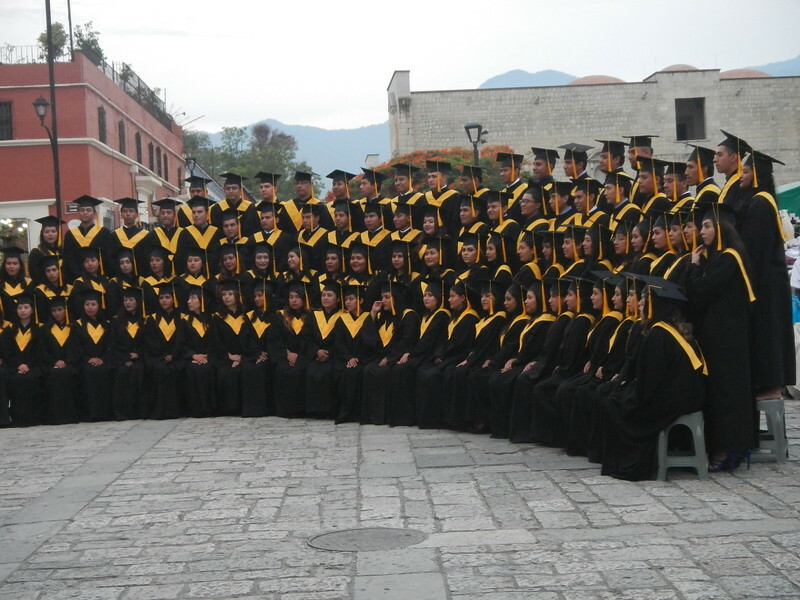 Hope you all got to the Cathedral, After the wedding reception, boarded a train and spent a couple of days in Oaxaca. Details over a beer sometime! 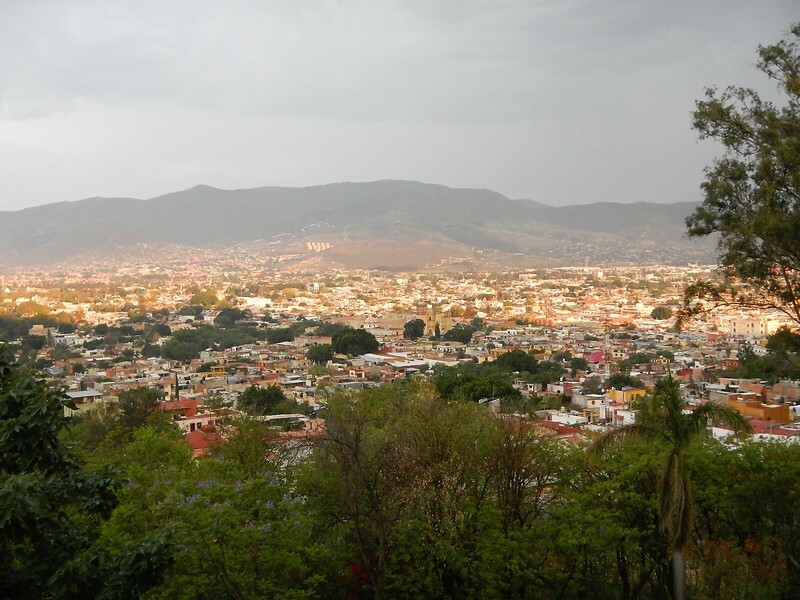 Last month I did Oaxaca to San Cristobal in one day including getting lost twice and terrible traffic in Tuzla 420 miles., Worst ride of my trip, have thought about it a lot that I should have stopped in Puerto Angelo. in Antigua now chasing your shadows, welcome home! So happy you two liked Hotel Victoria. That was our go to place in the evenings for the views and drinks. 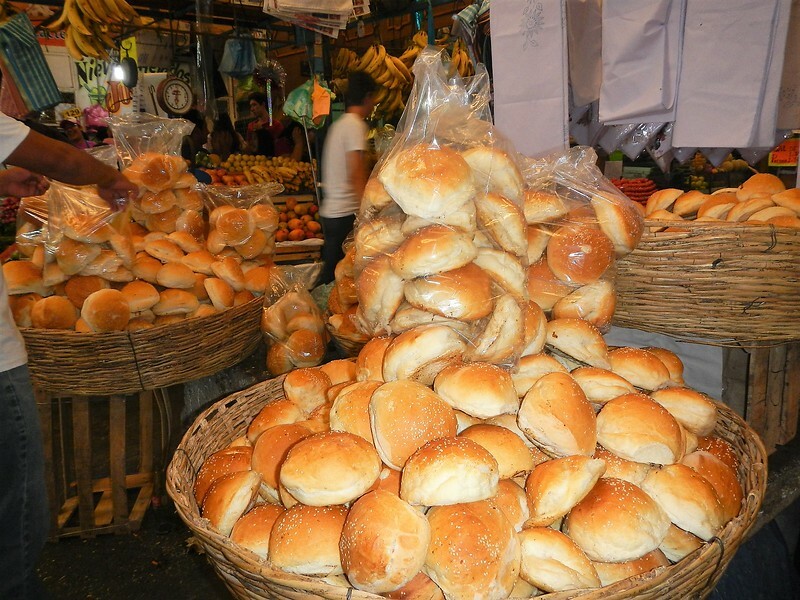 Of course, this makes me want to go back to Oaxaca! 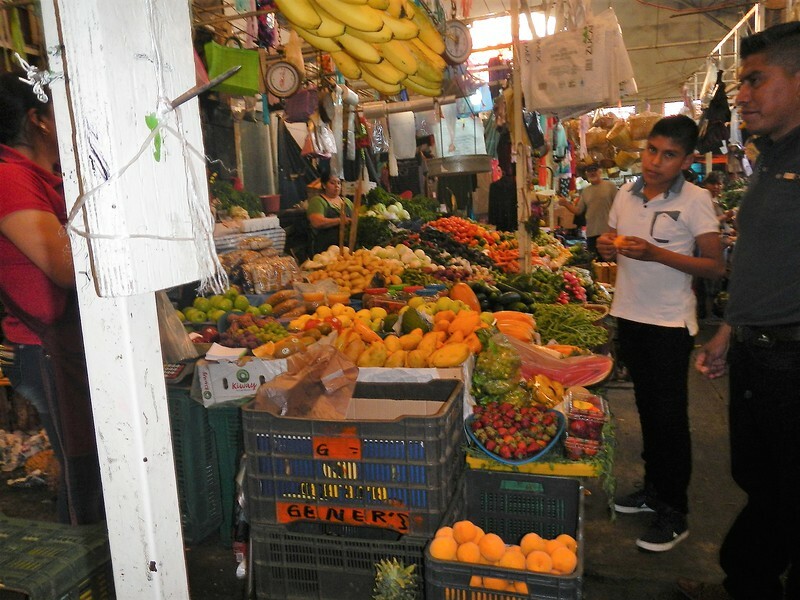 We spent 6 days in San Cristobal in March…lovely town. 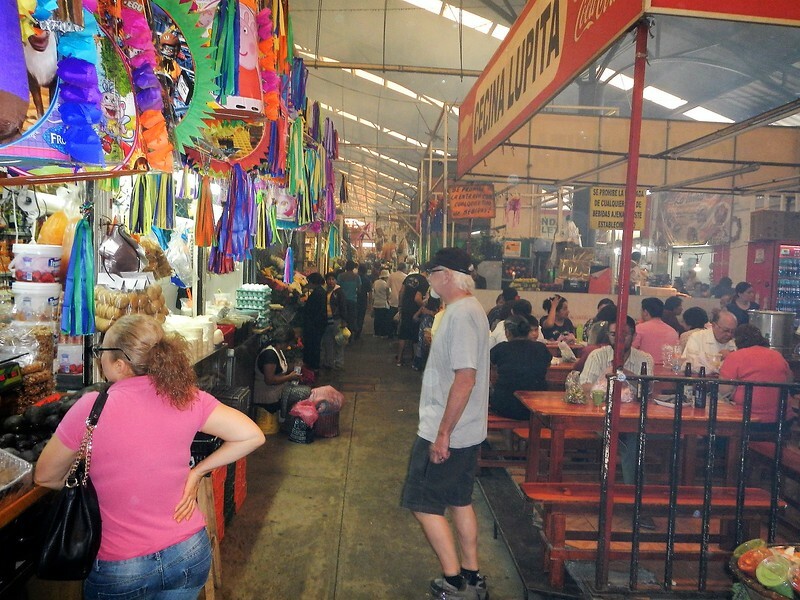 Mexico is a great place… Puerto Angel looks very interesting! Happy travels you two! We stayed at the Victoria too. So enjoyed it. Love all the photos! Deby it’s pie time. Come home. Just crossed into the US, we will be home July 15, can’t wait for pie!! Nice writing and riding … Have to go back and read the pre-mexico segment ….